Well it all started with the beginning of allergy season, also known as mouth-breathing season for me. Ever since my move from SF (where my allergies were fairly mild) down to south of San Jose (surrounded by farm land), my allergies, specifically nasal congestion, have been severe. This is my third year down here and I've got my allergy-alleviation routine down pretty good: neti pot (I like this ceramic one), Zyrtec, and nasal spray. But overall, I still end up breathing through my mouth a lot more in the spring and this leads to dry lips (especially this year with weird cold fronts coming through every other week). But the other day I was thinking how ugly the chapstick container is and how I have so many beautiful lipstick containers lying around (like those YSL ones mentioned above). So I thought why not switch the containers so I can use my daily lip balms in a prettier container? A quick google search told me to put both lipsticks in the freezer and with some gloves or wax paper, you can wiggle out the lipstick from the container and presto chango! Well it worked brilliantly for switching my chapstick with this Rodin lipstick. But certain brands, like YSL and Chanel, make lipstick tubes with no bottom. Instead the soft cream lipstick is held into place from the sides by some circular prongs. So it's pretty near impossible to switch those, which means all those YSL and Chanel lipstick tubes just have to be thrown away (whoomp whoomp). But I was able to switch out my friend's homemade lip balm with an old Shu Uemura lipstick (yay, some fancy looking homemade lip balm). I also take the extra step to use a hair dryer to melt down the balm a little bit, tap the bottom on the counter so the liquid settles, and then when it cools the balm will fit better into the bottom of the new lipstick case (again thanks Google and YouTube for the tips). All of this led me to think, it would be great to have a product like Plaine Products, for refillable lipstick/lip balm. And when I put this on Insta-story I got several people suggest Kjaer Weiss lipstick. So I looked them up and was this close to buying it, when I thought I probably should try to find a review of this somewhere since Kjaer Weis lipstick is expensive! And I'm so glad I did because this is one of the top reviews I found from an Asian blogger in Australia (who by the way reviews a lot of natural and organic products). As a reviewer myself, I appreciate a good review and well she is good. She's very thorough and when she describes how the lipstick goes on, I know exactly what she's talking about. And bonus that she's Asian so I can see how it would work with my skin tone. So her verdict about the Kjaer Weis lipstick: it's dry. So nope, I'm definitely looking for something that will moisturize. Plus even though it's "refillable", it's not zero waste since the cartridge the lipstick comes in is still thrown away (see pic below). And I'm looking for a model where you don't throw anything away. Hourglass lipsticks were another suggestion, but again when you're done with the lipstick you throw away the cartridge. 1) Buy Burt's Bees lip balms and tints and put them into the containers I have now (cuz you know I want to keep it pretty). And then recycle the Burt Bees containers through their recycle program. 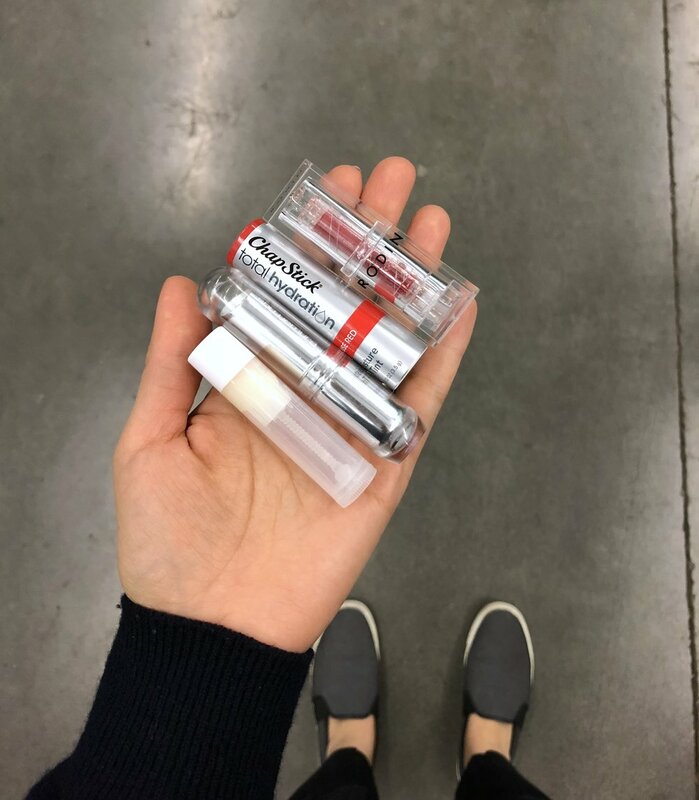 2) Or make my own lip balms, put them into the current lipstick tubes (sanitized between usages) and re-use the plastic lip balm tubes as molds (so I can use them indefinitely without getting germs on them). I saw this kit on Etsy and I really want it so I'm leaning towards this method lol. What do you think? Which method do you think is better?